This is a book for both home gardeners through to professional horticulturists; nurserymen, seedsmen, garden managers, landscapers or cut flower growers. 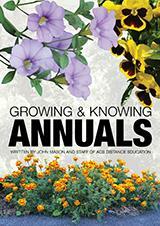 Written by John Mason and staff, Growing and Knowing Annuals is 141 pages packed full of beautiful colour pictures. Common Name: Stock, Ten-week Stock, Gillyflower, Night-scented Stock. Appearance: Simple or lobed leaves, 4-petalled flowers in dense racemes and highly scented. Wide range of colours. Culture: Moist,well-drained soil, pH neutral or slightly alkaline. Large double-flowered cultivars may need staking. Full sun but will tolerate part shade. Propagation: Seed sown in gentle heat in spring. Sow seeds in situ for Night-scented Stock, in trays for others. Prick out when sturdy seedling. Health: Usua lBrassica problems – club root and downy mildew. Aphids, flea beetles and cabbage root fly all possible. Uses: Cut flowers, borders and beds, cottage/informal gardens. Good bee plant. Cultivars/Species: Around 55species including M. incana, M.fruticulosa, M. longipetala subsp. Bicornis (Night-scented stock). Cultivars: ‘Mammoth Column’, ‘Apple Blossom’,‘Cinderella’ series, ‘The Seven Dwarfs’, and many more.